The History of Protestantism in a Nutshell! The first major split off from Rome and the Catholic church was the Eastern Orthodox church, from which all the various Orthodox groups came--Russian Orthodox, Greek Orthodox, Syrian Orthodox, etc. The Eastern churches were really the first split-off from Rome. Later, of course, Protestantism split off from Romanism also. 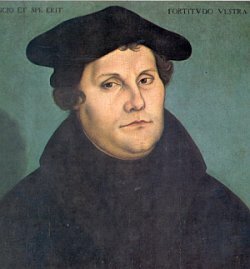 Martin Luther was the leader of the Reformation when Protestantism first split off from Catholicism, and the Lutherans were the first major Protestant denomination and the largest and most powerful, because they swept Germany and the Scandinavian countries, and that's why Luther's usually given credit for being the leader of the Reformation. But there were also many other reformers: Savonarola in Italy, John Knox in Scotland and Henry VIII in England and Calvin in France. Calvin was a Frenchman who had to take refuge in Switzerland, where John Knox visited, studied under and became a follower of Calvin and then returned to Scotland and led the Reformation there, organising the Presbyterian Church. So the modern-day Baptists and Presbyterians are usually considered descendants of the Calvinist Movement of those days, although there were Anabaptists before that. They followed Calvin and were called Calvinists, and their major doctrine was called Calvinism, of which you and I (members of the Family International) are firm advocates! : Salvation by grace!--Eternal Salvation!--Once saved, always saved! That was Calvin's strong doctrine, along the line of Luther's also: Salvation purely by grace, not by works. Because at the time of the Reformation, the Catholic Church was strictly a religion of works and practices and church-going and ceremonies and all the rest.--And that's still what they preach today, let's face it: You've really got to earn your Salvation by your works! And of course, nobody could ever make it that way! So they're building their Salvation on a poor foundation of their own self-righteousness, when only Jesus can save! In those days all of those reformers were considered Protestants because they Protested! They were protest-ants--Protestants. And of course they were risking their lives to do it, because the Catholic Church held sway and held power and controlled the System and the police and they very often didn't hesitate to slaughter them or throw them in prison or beat them or whatever! One big army and invasion that the Pope sent North slaughtered one million Protestants in Bavaria alone!--And that's why Bavaria is almost solidly Catholic to this very day!--They just wiped out all the Christians! So the protestants got their biggest push primarily from Martin Luther, and John Calvin was sort of the Luther of France, and virtually all of those first Protestants were "grace" people. They were sick of the Catholic Church, which was all works, so to really make the break they had to break completely with a real doctrine of grace!--"Once saved, always saved!" --Real grace!--Saved by grace and kept saved by grace, not by works!--Eternally! BUT Then along came dear John Wesley! Sometimes I wonder about him--the Devil up to his old tricks. Under King Henry VIII, the Church of England had already split off from Roman Catholicism, but 200 years later, Wesley split off from the Church of England and began the Methodist Church. And although he supposedly preached grace, his major doctrine was so-called "Holiness", a strong religion of works rather than grace.--You had to be holy, good, perfect and not sin!--Or you could lose your salvation every time you had a bad thought! The grace people all came, of course, out of the Catholic Church first, originally, and the works people came out of the Church of England through the followers of Wesley or the Wesleyans, and all the variety of Methodists and "Holiness" denominations came from the Wesleyan Methodists, including all the various Pentecostal denominations! So Luther, Calvin, Knox and virtually all the early Reformers were grace people, and this swing back to works didn't come until the days of Wesley when he began to promote works and piety and self-righteousness! So the Protestant Church divided into those two main camps: Calvinistic, "Once saved, always saved", and the Wesleyans on the other hand. I used to say the one had the doctrine of Eternal Security and the other had the doctrine of Eternal Insecurity: Often saved--but you can never be sure!